One act of violence is not enough to fulfill Xaphan’s plans. One near escape does not justify Winter’s growing gift. There is more. She can feel it. The warnings swell within her. He’s searching for someone. A person of promise … a person of prophecy. And Winter must find her first. Book 2 of the Winter series, supernatural thriller for teen readers and older. Newsome did it again! Another amazing story that got me out of my usual genre. In Winter (Book 1), we were introduced to Winter. She opened our eyes to things unseen. In Prophetess, we learn more about Winter’s life and struggles. She is a character that I would normally shy away from if I met her on the street. Yet, Newsome has broken all stereotypes. I love her heart and her desire to live out God’s calling in her life – regardless of the risks. 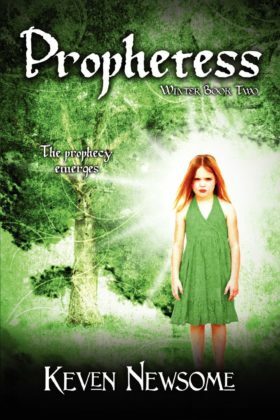 If you like adventure, suspense, battles between good and evil, and seeing God’s hand at work, Prophetess is a must read. If you don’t like those things, you should get out of your comfort zone and read it anyway.